It’s been so wonderful writing and I really appreciate all of the feedback. I’m going to take a week and ponder the idea of continuing or wrapping it up. Either way I’m so honored that I have had a steady group of people from all over the world reading and making small changes that ripple to all corners of the planet. 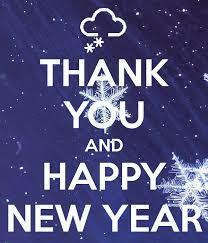 To all of you, may your New Year be everything you dreamed it would be and more. Love and blessings. Have a Merry Christmas, a Happy Hanukkah, a joyful Boxing Day, a festive Kwanzaa, and a peaceful Winter Solstice! This week for Small Change #56 It’s time to relax, kick back, enjoy the holidays and feel peace. Seems like a rather simple small change, but is it? 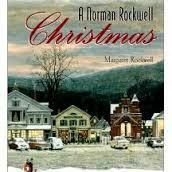 With last minute rushing around, shopping for the perfect gifts, trying to please out of town company, and wishing for the perfect Norman Rockwell holiday, it’s no wonder we often feel depleted and disappointed. So this week, let go of what you think is the perfect holiday. Savor time with family and friends and most importantly, keep in the forefront the reason behind why you are celebrating. In yoga class the other day my teacher laughed, saying that every time she turned her back to look at one side of the class she could see the other side relax in their posture, when she turned back around, everyone would quickly straighten up and put more effort into their pose. I began to think about this, do we not live up to our excellence? Do we only shine out while others are looking? Are we not worth impressing our selves? Maybe no one is looking but we know that deep inside we’re cheating ourselves from being our best. For example; no one is looking, so do you surf the net at work? Do you show up late because other employees do? It’s raining and cold out, do you put away the shopping cart? Do you plop the book down in the bookstore and not return it to it’s proper shelf? Do you do only what you need to do to appease family and friends? The energy of lack will flow off of you and seep into every part of your life. Maybe this doesn’t sound like a big deal but it all adds up to the way we live our lives. If we live by doing just enough to get by, then that is exactly what our life will be, a life of just getting by. We are magnificent, so our lives should shine out with brilliance. A life of brilliance begins with you, when no one is looking and you make the choice to go the extra mile, put forth more effort, and shine out your excellence. When you go out of your way, you may not get acknowledged by another, but your life will surely reflect it. 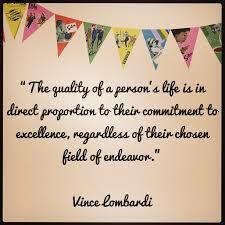 Begin this week to create a life of excellence in all you do. 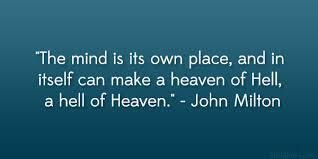 In every situation, from big to small, your thoughts create either heaven or hell. All day long this power to choose resides within you. Here is how it works; Lets say you have an IRS bill to pay, this never seems to be a happy fun moment, and your thoughts go something like this; “Why do I have to pay this much? I made less this year, and need to pay more? how can that be? It doesn’t seem fair. All of my savings are now in their pockets.” And on and on it goes, most likely a good part of your time in now spent in a type of hell from anger and frustration. But you can choose a different thought, you still have to pay the bill, and you are human so you may get momentarily frustrated, change from irritation to thoughts like; “I’m so glad I have the money saved to pay this bill.” It still may not be a happy fun task, but now you can live in a type of heaven and your mind is free to focus on other things. This happens throughout your entire day, you are given an opportunity at every moment to choose heaven or hell by your thoughts, and we’re said to have over 60,000 of them a day! It takes a lot of practice to stay aware of your thoughts and even more to change them. 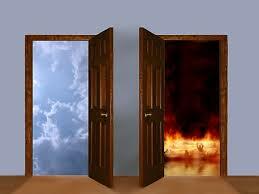 This week be consistently aware of your thoughts and then make the choice to live in either heaven or hell. 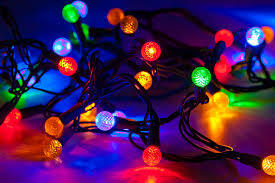 I live in a neighborhood where the Christmas lights are already up and running! I love the enthusiasm but you can feel the pressure from smiling neighbors to “not even think about slacking”. So I started to ponder all I need to do; buy gifts, pick out cards, mail to out of state relatives on time this year (same thought as every year), decorate the house, host a party, and on and on and on. I started to feel pressure about all I need to do and then realized, how lucky I am; What may seem like a burden is actually an amazing gift. I have wonderful relatives and friends that I get to shop for. I have a house to decorate. I have neighbors that make the neighborhood beautiful and festive. And I’m alive to enjoy the holiday season. So now, as I look at the lights all around me, they’ll be my sign to lighten up and savor each moment. This holiday season, slow down and relax, enjoy the moments you usually rush through, and be grateful you’re alive to enjoy it. As you see the lights going up, smile and Lighten’ up.